Welcome to Grand Island's "ReUnion Central"
Over the years, we've helped you....can you help us? 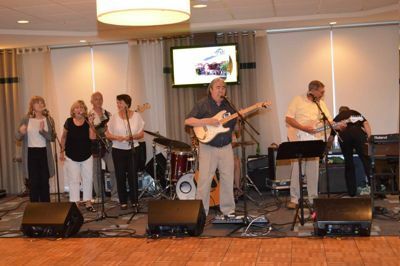 30 Year Reunion - Wednesday, July 3, 2019 - Sandy Beach Yacht Club, 7:00pm - ? Join the GIHS Class of 1989 Facebook group and event, if you haven't already. More details to follow so please spread the word, really hope to see everyone! Contact Amy with questions at: thesamplinskis@aol.com. Saturday, July 6th, 8:00PM -Say Cheese Pizza Company, 1771 Love Road , Grand Island, NY 14072. Cost: $30.00 per person pre-sale, $35.00 per person at the door. Three hours of open bar includes: Premium drinks, wine, domestic draft and bottled beer, and soda. Pizza, salad and breadsticks. Payment options: PayPal: patterson2819@roadrunner.com. Choose "Send to a Friend" so there is no fee. Checks payable to: Stephanie Patterson, 147 Old Carriage House Road, Grand Island, NY 14072. Payment due by Monday, July 1st. SAVE THE DATE!!!! GIHS Class of 1979 is planning their 40th reunion for Friday evening, July 5th, at the Buffalo Launch Club. Facebook Page. The Grand Island High School Class of 1973 is having their 45th reunion on Friday, July 6, 2018 at Ellden's at River Oaks, from 7:00 p.m. - midnight for an informal reunion of classmates and spouses. There will be a cash bar and appetizers on the upper deck. Please let one of the committee members know if you wish to attend so we have a rough estimate. Mike McDonough- mike@mchomes.com, Denise Filosofos - denise.filosofos@gmail.com, Shirley Lewien Reitebach - sirpwd@gmail.com, Rod Raham - rdr047@roadrunner.co, John Mondoux - jdmondoux@roadrunner.com, Tom Burke - Tfburke30@hotmail.com. Visit our Facebook page - High School Friends and let us know. The Grand Island High School Class of 1988 is having their 30th reunion on Friday, July 6, 2018 at the Sandy Beach Yacht Club, 1851 Winter Road, at 7:00 p.m. Check out the Facebook page "GIHS Class of 88" or contact gihsclassof1988@gmail.com. The 40th Reunion for the Grand Island Class of 1978 is approaching quickly. Please make your reservation and follow up with your $50 payment by May 18, 2018 to Margie Wood, 11784 Rapids Road, Akron, NY 14001. Details are on the Class of 1978 Facebook page. Classmates are also invited to attend a school tour on Friday, June 29 at 11:00 am. Please let us know if you can make it! The Grand Island High School Class of 1978 is having a 40th reunion on Saturday, June 30th at the Radisson Hotel Grand Island (formerly Holiday Inn). Details on Class of 1978 Facebook page or contact Margie at mmwood19@gmail.com or 716-352-2980. Grand Island High School Class of 1968 is having their 50th reunion over the July 4, 2018 holiday. Save the date! See flyer. Facebook Page. Reservation information to follow. LaSalle High School Multi-Class Reunion Picnic. Classes of 1963, 1964 and 1965. Saturday, August 5th, 2017 from 1pm to 7pm. Fairmount Park, Wheatfield NY. Reservations and Information call (716) 405-7212. GIHS alumni are invited to attend a school tour on Monday, July 3, 2017 at 9:00 a.m. You will be amazed at the changes made over the last 10 - 50 years! Leading the tours will be Athletic Director Jon Roth and long-time musical director and teacher Maggie Miller Kennedy. You can also contact Pattie Anderson Frentzel at frentzel@roadrunner.com. Our 10-year GIHS Reunion will be Saturday, July 1, 2017 at PEARL STREET GRILL & BREWERY from 6:00pm - 9:00pm. Tickets are $55 and this covers: Our own private room with a balcony on the third floor, food, and 3 hours open bar!! Tickets are available to purchase online only NOW until Sunday, June 11th. You are welcome to bring a guest with you to the reunion! You can purchase tickets at http://gihs2007.us .You will get a confirmation email after purchase. Reunion organizers will have a master copy of the attendee list for entry - Feel free to email us at gihs2007@gmail.com for any direct questions!! PEARL STREET GRILL & BREWERY, 76 Pearl Street, Buffalo NY 14202 - (716) 856-2337. Off- street paid parking is available across the street and under the skyway - prepaid parking is not included in our event. We are working on securing a discounted rate and will update you via email on our progress (we will receive your email address once your ticket is purchased). Or to be "perfectly correct" , Indigenous Americans Weekend. Kick-Off Party at TC�s on Grand Island Blvd. The Buffalo Harbor Boat Tour will be aboard the Grand Lady and will include a light lunch. The Grand Lady is now docked near the Buffalo Harbor and the tour will be of the Buffalo River and the Buffalo Harbor. This will give everyone a chance to see the wonderful renaissance occurring in downtown Buffalo and the waterfront (Canalside). The Grand Lady price will be $30 a person (additional). Dinner prices are $67 per person or $125 per couple. To continue our planning we would like to know if you are planning to attend the boat tour and the dinner ASAP. We would also appreciate people purchasing tickets for the events they plan to attend at this time so we can cover deposits and startup costs (we have a deposit deadline coming up this week). Any donations would also be greatly appreciated. Irene (Austin) Ehde, 1881 Webb Rd, Grand Island, NY 14072. We are also looking for folks not on this mailing list. If you know of anyone not on the list please forward this message and send us the contact information. - any updated information will be put on that page. If you reading this and not on this list? Why not? 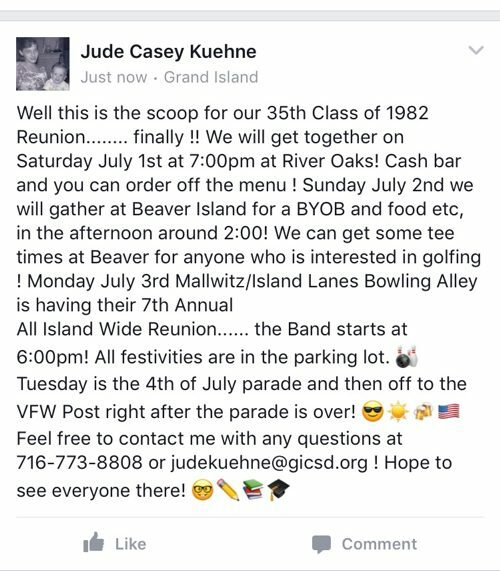 GIHS Class of 1992, 25th Reunion is on Sunday, July 2nd at Beaver Island Boardwalk Bar at 6:00 p.m. Pass the word to your fellow classmates. Contact Kim Kalman at kim@raru or 465-5574. Look on Facebook. This is no longer a paid event. Cash bar and food available. GIHS Class of 1987, 30th Reunion is on Saturday, July 1st at Beaver Island Casino at 6:30 p.m. $50 per person includes food and open bar. Pass the word to your fellow classmates as invitations will not be sent. Contact Sue Marston at 982-7366, mail checks to 3040 Love Road, made out to Sue Marston. Email: sue.marston@yahoo.com. A Facebook is being set up. UPDATE: Plans have been made for the Class of 1977 40th reunion picnic at Beaver Island State Park on Monday, July 3rd from 12 - 7 p.m. at Shelter 4B. Classmates from 1977, teachers, other GIHS alumni, family and friends are invited to attend. It will be a catered event and we will need an approximate head count to be able to secure the caterer by May 15th. (before the next meeting which is set for Wednesday, May 17th @6:00 p.m. at Mallwitz Island Lanes). There will be time to add on, BUT.. we would like a general idea please. Your admission to this exciting event will include food, water, volleyball, corn hole, music and reconnecting with old friends. BYOB or beverage of choice, munchies, finger food to pass and a chair. A 50/50 split will also be available to help offset expenses. The cost is $15 per head. Checks or Money Orders payable to "GIHS Class of 77" sent to PO Box 412, Grand Island, NY 14072. Parking fee is $7 into the park. There is a Facebook page entitled "Grand Island High School Class of 77 Reunion" please spread the word to any friends that you are in contact with. Future updates will be posted on Isledegrande.com or FB. The party can continue at the "All Island Reunion", Monday night, July 3rd 7-??? at Mallwitz Island Lanes...band and cash bar! On July 4th...parade on GI Blvd., followed by an all Island gathering at the VFW Post Beer tent, food trucks and friends. Please feel free to contact Joann Santospirito through FB, at 716-830-4046 or email GrIsJo@aol.com. In the spirit of keeping things affordable for our 40th class reunion the committee has decided to have a picnic at Beaver Island Park on Monday, July 3rd, from 12:00-dusk. We plan on having it catered and it will be a BRING YOUR OWN BEVERAGE event. Details still need to be worked out for the catering and for the cost. We will need a general idea of how many plan on attending so we can give the caterer a number as July creeps closer. We chose the shelter near the sledding hill where there is a volleyball net accessible if anyone wants to organize a game or two. We will be looking for any locals that may have pop up canopies that are no larger than 10 x 10 (anything larger will be an additional $40 for the permit ) and extra chairs for seating. There is electricity on the site if anybody is interested in creating a playlist and being in charge of sound�. If anyone is interested in organizing a golf tournament, please feel free to do that and keep us posted. There is an all Island reunion July 3rd at Mallwitz Island Lanes, Whitehaven Road starting at 7:oo p.m. This is their seventh year and quite a few people show up. There is a band, cash bar for liquor inside the bowling lanes and beer available outside where the party is. On July 4th Grand Island always has a parade down Grand Island Blvd. and then everybody is welcome to go to the VFW Post. There are food trucks and a beer tent available, and it is another great place to run into old friends. Laureen Zelonis Hess has graciously volunteered to create name tags again. She also would like to recognize our classmates that have passed.. We are aware of at least 21 that have passed away, but if you know of others that we may have missed please contact Laureen through Facebook. George Ihle is soliciting businesses to be sponsors for th class reunion. For as little as $50 a small business or company will be included on the sponsorship board that will be displayed at our reunion. If you own a business, or work for a company who may be interested please let George know at george_7459@hotmail.com. There are still a few more details to work out and if anyone has any suggestions or questions please let us know. The next reunion meeting is Wednesday, March 22nd at 6:00 p.m. at Mallwitz Island Lanes. Contact Joann Hudson at 716-830-4046. Grand Island High School class of 1977 is starting to plan for their 40th reunion which will be situated around the Fourth of July festivities on Grand Island. The first meeting will be at Mallwitz's bowling lanes on Whitehaven Rd., Wednesday, November 16th at 6 o'clock. There has also been a Facebook page set up entitled "Grand Island high school class of 77 ". 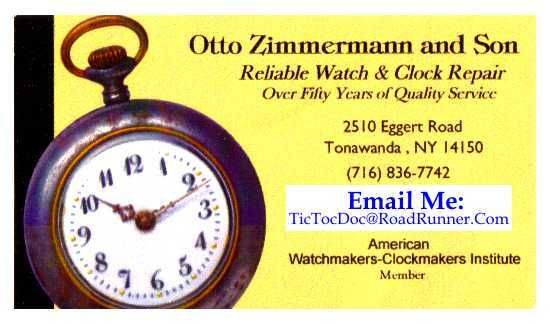 Please feel free to contact Joann Santospirito through Facebook or 716-830-4046 . Class of 1966 - click for larger view. The Grand Island High School Class of 1966 celebrated their 50th reunion on Saturday, July 2nd, at the Four Points Sheradon in Niagara Falls. They have the honor of being the first class to graduate from Grand Island High School. Special guests were teachers H. David Meyers and Hugh Sharp. Also invited were Shirley Luther, mother of graduate Robert Luther who was killed in action in Viet Nam and Julie Swain, daughter of graduate Terry Swain. The welcoming speech was given by classmate Nancy Buckley Valone. Karen Sugar Oswald also of the class, led the prayer which was originally written and presented by the late Reverend Nick Linde at the 20th class reunion. Before the DJ for the evening began the music portion of the reunion, a special gig was performed by the "Grand Island Traveling Band". In the process of searching for members of the 1966 class, the members of the future band discovered they all lived within three hours of each other. They got together and the band was formed. Mary Stewart has posted a bunch of pictures on her FaceBook page. Front, from left: Tour guides and assistant principals Mike Carter and Corey Gray. 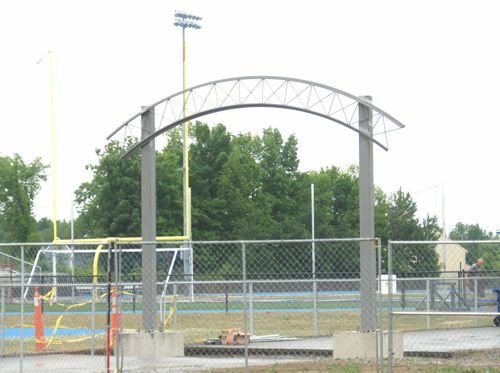 New entrance arch to Gene Masters Field at the H.David Meyer Athletic Complex. The GIHS Class of 1966 organized a tour of Grand Island High School on Friday, July 1st. 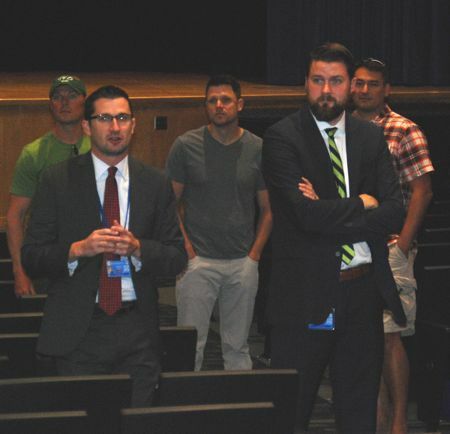 Approximately 50 former students from the classes of 1966, 1976, 1986 and 1996 attended and enjoyed seeing the changes made over the years, especially those from the recent capital project. Thanks to assistant Principals Corey Gray and Mike Carter for showing the groups around. Especially impressive was the STEM wing that houses the technology department and the new H.David Meyer Athletic Complex. The Grand Island High School Class of 1966 has set up a tour of the High School on Friday, July 1st at 11am. Meet at the main entrance. The tour should take about an hour. Everyone is welcome. Contact information: email valonen@yahoo.com. GIHS class of 1996 to hold 20 year Reunion on Saturday, July 2nd at Speak Easy Parlour, located on the 4th floor of Pearl Street Grill & Brewery. Tickets are $65/person and include hors d'oeuvres, 3 hours OPEN BAR, dinner & desserts. For additional information please contact Christina Galbreath at 843-816-2814 or Christina@hiltonheadhomes.com. Update: Class of '86 is trying to set up a service project around the time of the reunion. Class of 1986 30th Reunion will be held on July 2, 2016 at River Oaks. Check out our Facebook page. Website - Contact Marijane Smith at tmjers@gmail.com. Jan Baker, Sharon (Benzing) Minet, Nina (Braddell) Goss, Nancy (Buckley) Valone, Nancy (Carlson) Becht, Jerry Cahill, Joanne (Clark) Linenfelser, Bonnie (Click) Kaiser, Mary (Cudmore) Vari, Linda (Darby) Facklam, Steven Dreyer, Tim Ehde, Richard Franke, Terry Funk, Richard Gibbons, Chris (Glover) Nagao, Beverly (Harmaty) Speller, Paul Harper, Roxanne (Hillman) Johnson, Linda (Hillock) Clark, Linda (Johnstone) Pinzel, Betty (Kantenwein) Foley, John Killian, Syliva (McCullough) Henry, Kathleen McFee, Cathy (McNamee) Wilhelm, Susan (Milkey) Cronin, Charles Mock, Francis (Muench) Russell, Jayne (Pless) Miller, Roy Polliard, Karyl Reinauer, Dan Rowe Buenafe, Jim Rosensteele, Rita (Satterlee) Rosensteele, David Schaefer, Barbara (Schopp) Bell, Ray Sommers, Karen (Suger) Oswald, Cathy (Trautman) Kaegebein, Dan Walgate, Rick Whitmire, Ed Sargent, John Madia, Jeff Carr, Brenda (Atkinson) Black, Sandra (Johnstone) Murzet, Robert Miller, Mike Yensen. Classmates We Cannot Find: Any information would be helpful to find them. Claudia (Clor) Grandin, John Diringer, Leigh Harper, Scott Herlan, Thomas Levin, Richard Skotnicki, Jane Sirois, Linda Smith, Glenda Tysinger. UPDATE: Nancy Buckley Valone and the class of '66 has set up a tour of the High School at 11:00 a.m. on Friday, July 1st. The tour is expected to be 45 minutes to one hour in length. The 50th reunion will take place over the July 4th weekend. A dinner dance will be held on Saturday, July 2nd, all class reunion at Island Lanes on Sunday, July 3rd and picnic at the VFW on July 4th after the parade. See invite. Class of 1966 50th Reunion will be held on July 2, 2016 at the Four Points By Sheraton, Niagara Falls, NY. More information to follow. Please contact Nancy Buckley Valone via email with your contact information. ie: Address, email, phone. valonen@yahoo.com. Friday, July 1st, 11am - Grand Island High School Tour, meet at the Main Entrance. Saturday July 2nd, 6-11pm - Jo Kozek Stiller will be hosting a bonfire/gathering at her house. The party will be open to classmates and their spouses or significant others. Please pass the word to those not on FB. This is for our class only!! Please bring an appetizer to pass and a chair and your own beer/beverage. Non-alcoholic drinks will be available. Although you can just show up that evening, we'd like to have an idea of how many people will be joining us. So - if you know you are definitely coming, please let Jo Kozek Stiller via email ruachrest@gmail.com, or the "Grand Island High School (NY) Class of '76 Reunion page on Facebook". Sunday, July 3, 2016 (Main Event) -Grand Lady boat cruise from 6-9pm. Please meet at Rich Marina at the foot of Austin Street at 5:30pm. The boat ride will include appetizers and have a cash bar. There are still spaces available for the cruise!! If interested, please let us know! Sunday July 3, 2016 - 9 pm - Mallwitz Bowling Alley on Grand Island All Island Reunion. We will have two pop-up tents set up with tables, bring your own chairs. We have a sign to designate our area. Mallowitz has a band, food and drinks. LOOK for the FIRE PIT!! (and the fun). 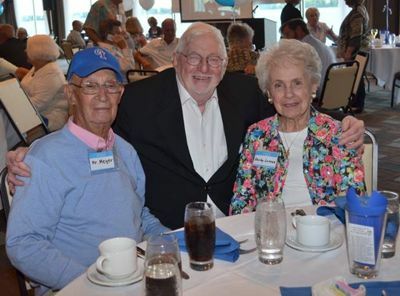 SAVE THE DATE: The 40th Class Reunion will be held on Sunday, July 3rd on the Grand Lady. Enjoy a cruise on the upper Niagara River from 6:00 p.m. - 9:00 p.m. Home port is Rich Marina, off of Niagara Street in Buffalo. Light refreshments will be served and a cash bar will be available. See details. Confirmed Reservations: Helena (Kovacs) Brierton, Debbie Bleich, Judy (Popiel) Siehnel, Kathy (Brown) & Lar McNally, Jo (Kozek) & Rick Polinsky, Maureen Phillips, Linda (Siverson) Campbell-Cancelled, Sue (Hood) Sondel, Jeff & Eileen Stone, Kathy (Robinson) Houck, Debbie (Taylor) Spencer, Ann( DiMarco) Streeter, Kevin & Sally (VanHattum) Kelley, Georjean Sizemore Labuzzetta & husband, Chris Russell & bride, Pat (Caffery) & Joe Roncone, Rich & MaryLee (Wunsch) Widdicombe, Maureen (Greco) Capanyola & husband, Rick & Fred DeCost, Mike Mullany, Jamie & Luisa Farrell, Scott Pauley, Tim Egan, Tim Geisenhoff. Maureen (McGuire) & Rand Kielt, Ingrid (Vogel) & Keith Kinney, Kathy Arch, Deanna Mesmer, Amy & Dr. Steve Valone, Jim & Sue Davis, Karen (Hall) & Marty Schooping, Tina & Nicole Miller, Lauren Kroening & Jim Ketcham, Dana (Gruber) & Randy Mirowski, Jennifer (Arnst) & Terry Schumacher, Nancy (Tompkinson) & Jay Hollinger, Dale Morgan & guest, Mrs. Laman. The Grand Island High School Class of 1976 is looking for contact information on the following people. Email Jodi@giecom.net, if you can share information. James Benz, Rajnesh Bharadwaj, Joan Blakely, William Cook, Patti Dauncey Schitchtel, John Fetter, David Forester, Martin Gavrila, Deborah Gilmore, Elizabeth Hanny, Charles Harrison, Jeff Jordan, Randy Martin, Laslo Nemeth, Thomas Papson, Kimberly Price, G David Regan, Bill Schultz, Cheryl Smith, Judy Talbot, Christopher Taylor, Susan Trzeciak, Andrew Werner, Charles Witnauer. Attention class of 1980, it's our 35th reunion. Okay classmates nothing formal...the plan is to meet up at Mallwitz Island Lanes on the evening of July 3rd at the "All Island Reunion" gathering, it is located on Whitehaven Road. There is a live band outside in parking lot. Always a good time!! Cash bar for food and drinks available. There is a informal picnic planned at the Grand Island Moose Lodge on Grand Island Blvd next to KOA Campground on July 5th at 1:00pm to whenever. There will be a cash bar and we ask you to bring a dish/dessert/snack to pass. Anyone wanting to make donation for paper products and hot dogs for the Sunday picnic, please mail a check payable to "Class of 1980" and mail it or drop it off to 1607 Love Road, Grand Island, NY 14072. Any questions can be directed by email or phone to Glenn Wakefield at 622-1166 or Nancy Hoover Anderson at nannerfrog1@yahoo.com, 907-9037 or you can send me a friend request on Facebook so I can add you to the event. LOOKING FORWARD TO CONNECTING WITH EVERYONE! ***PLEASE SPREAD THE WORD TO OTHER CLASSMATES, I KNOW NOT EVERYONE IS ON COMPUTER! Nancy Anderson. The GIHS class of 1995 is having its 20th Reunion this summer. There is a Ice Breaker planned for Thursday, July 2nd and a dinner on Friday, July 3rd at Beaver Island Club House. See flyer for complete information. RSVP deadline is June 14th. Save the date! 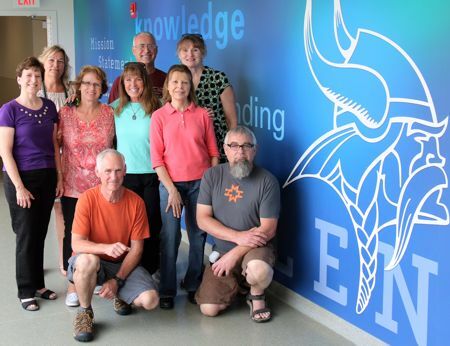 The Grand Island High School Class of 1985 30th Reunion will be held at the Buffalo Launch Club, 503 East River Rd., Grand Island on Saturday, July 11, 2015 from 6:00 p.m. until ?. There will be a cash bar and food stations. An appetizer hour (crudit�) from 6-7 pm, then a carving station with roast beef and turkey, pasta station, fiesta and Caesar salads and grilled veggies. Tickets will be $45. Contact Brenda Baldwin 716-940-3656 and Sue Hughes 716-759-7218 for more information. See website with all the details at www.gihs1985.us. The Grand Island High School Class of 1975 will hold a 40-year class reunion social event at the Buffalo Launch Club, 503 East River Road, Grand Island, New York 14072 on Friday, July 3, 2015, from 6 pm to 9 pm. There is no charge for admission. A cash bar will be available. Enjoy 70s music, prizes, split club, and class CDs. If you would like to have dinner that evening, you must make dinner reservations from 5 to 8 pm and call the BLC (716-773-7629) BEFORE Friday, July 3rd. Please let the BLC know that you are with the GI 1975 Class. A special menu will be provided, including Chicken Wings, Chicken Fingers, Roast Beef on Weck, and Beer-Battered Fish Fry, as well as salads and full dinners. Teachers and students from any GI 1970s classes are invited. Bring your old photos to share. Mallwitz�s Island Lanes, 1887 Whitehaven Rd, 773-0062, will hold its 4th Annual �Grand Reunion� Friday, July 3rd from 6-11 pm. The band starts at 7 pm. No cover charge. Drink specials and food available. Held outside (tents). Must be at least 21. Classmates from 1975, other GIHS Alumni, family and friends are invited to attend. Public welcome. Meet GI Class of 1975 classmates at the VFW Sat July 4th after the parade. Look for the GI Class of 1975 sign. Classmates interested in forming a Golf Outing July 4th weekend or requesting more information on weekend events, please call: 716-775-5527. Use this number to let us know if you are interested in attending the Buffalo Launch Club event on Friday July 3rd. We are currently creating another class picture CD. Please send photos of classmates from then and now to our class photographer, Brian Kelly, via e-mail (bkelly5683@aol.com) by the first week in June, and your photos will be included in the CD we will enjoy on Friday June 3rd. Please be sure to type into the �Subject� line: Class of 1975 pictures. Grand Lady Cruises has made a luncheon cruise available for us (chicken or beef)on Sunday, July 5th from Noon to 2 pm. All classmates, friends, and family are welcome. Cost is $45 per person for lunch and $22.50 to cruise without purchasing lunch. Please call 716 � 873 � 4630 and ask for Jenna. The yacht is located at the foot of Austin and Niagara Streets at Rich Marina, 5 Austin Street, Buffalo New York 14207. Please call asap to book (the cruise will fill up fast!) and you must let Jenna know you are with Grand Island High School Class of 1975. UPDATE: Registration Flyer. Check out their Facebook page. Grand Island NY Class of 1974 - High School Reunion. The Grand Island High School Class of '74 is planning a 40th reunion. The reunion will be Saturday, July 5, 2014 at River Oaks with food stations, music and a cash bar. The reunion committee is still in the planning phases, and we are looking to update our database with our classmates current contact information. Spread the word and block out the date. For more information contact Rom Figler at rfigler@verizon.net. The GIHS Class of '94 invites you to a "TWENTY-YEAR REUNION OF EPIC PROPORTIONS". The event will take place on Saturday, July 26th at Byblos Niagara (Holiday Inn) Niagara Room from 6:00 p.m. � 11:00 p.m. There will be food stations, refreshments, open bar (beer & wine), photo booth and reminiscing 20 years. Music is courtesy of Eric Volk, Premier Sound. Tickets are $60. Rooms are available at Byblos for $125, call 716-773-1111 and mention �GIHS Class of �94�. Any questions? Email: Gihsclassof94@gmail.com. See flyer registration form. The Riverside Class of 1964 website remains up, www.riverside64reunion.com. If you have any news contact Peggy at gabbypeg1@aol.com or Christine at cpsip@aol.com. The Grand Island High School Class of '89 is planning a 25th reunion. The reunion will be Saturday, July 5, 2014 at The Village Inn outside with a tent and a cash bar at 7:30 p.m. For more information go to the Facebook event page. Please register and send money to address listed if you are coming and review missing list. The planning for the Class of 84 reunion is going strong! The reunion main event will be Saturday, July 5th at Byblos Niagara (Holiday Inn) Riverview room. There are a select number of hotel rooms available for classmates at a discounted rate. For more information contact Barbara Buell Brown at barbbuellbrown@aol.com or call 716-773-7391. 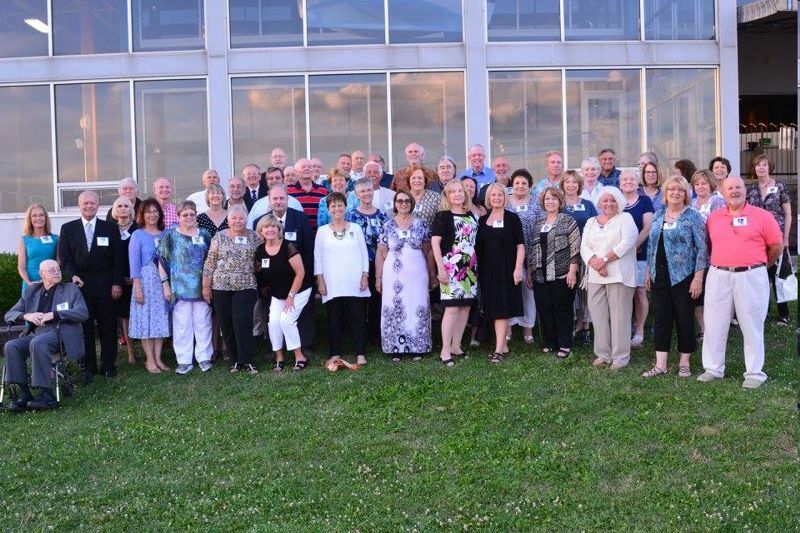 The Grover Cleveland High School Class of 1964 will hold their 50th reunion on Sunday, July 27th at Banchetti by Rizzo�s, 550 North French Road in Amherst. The party will include a dinner buffet, 5 hour beer, wine, pop, lemonade, ice tea and music. Tikcets are $50 in advance and are available by calling Marilyn Huber Murak at 716-725-6291 or Lois Giambrone Caruana at 716-685-2292. There will be an informal gathering at Templeton Landings on Saturday, July 26th at 7:00 p.m. for all to attend. Call above contacts for more information. 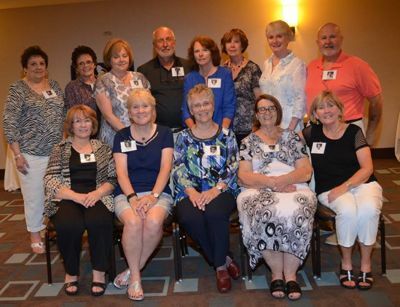 Niagara Catholic High School Class of 1984 30th reunion will be held on July 11, 2014 at Four Points Sheraton, Niagara Falls in the Lower Rapids Room from 6:00 p.m. - 11:00 p.m. Tickets must be ordered in advance. Contact Linda Butcher at lb63us@yahoo.com or go to our Niagara Catholic HS 1984 Facebook page for information. The Hutch Tech Class of 1984 is planning a reunion for June 13 and 14, 2014. 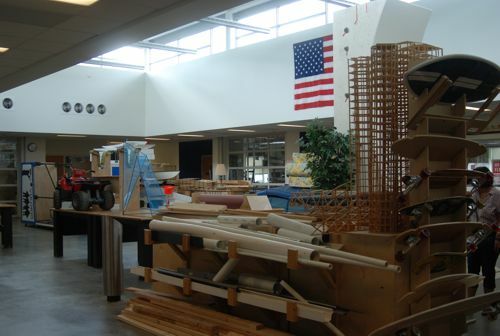 You can find information on Hutch Tech Class of 1984 Facebook page or email dfreedman@fergusonelectric.com. The Niagara Falls High School Class of '64 reunion will take place on Friday & Saturday, September 12 & 13, 2014 See schedule of events. A meeting is planned for Tuesday, May 20th at 4:30 p.m. at the Niagara Falls Memorial Medical Center, Tenth St. & Pine Avenue, in the First Floor Board Room. Everyone is welcome. We will be addressing Reunion Invitations. We are still looking for classmates, contact Chuck & Sheila Dunlop Rader @ cgrader@islechem.com or 716-773-3129. In 1961, 50 Sidway graduates were chosen to attend LaSalle High School. If you are one of them and have not been contacted or know of a classmate that has not been contacted, please email lasallehigh64@gmail.com. The reunion will be September 12-14, 2014 in Niagara Falls. Again, Mallwitz's Island Lanes is sponsoring the 3rd Annual Grand Reunion. The party will be on Wednesday, July 3rd starting at 6:00 p.m. Live music provided by "Wide Right" will begin at 7:00 p.m. This event is taking place outside. All GIHS Alumni and friends and the general public over 21 are invited to attend. There is no admittance charge. A cash bar and food will be available for purchase, including wood fire pizzas from Pizza Amore. The Tonawanda High School Class of 1963 is having their 50th reunion the weekend of July 12th, 2013. 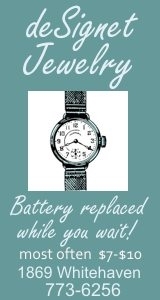 Call Karen Baldwin Marshall at 693-1522 for more information. The class web site is tonawandahighschool1963.info. Missing person list. Because last year's party was so much fun, Mallwitz's Island Lanes is sponsoring the 2nd Annual Grand Reunion. The party will be on Tuesday, July 3rd starting at 6:00 p.m. Live music provided by "Joe and the Schmoe's" will begin at 7:00 p.m. This event is taking place outside. All GIHS Alumni and friends and the general public over 21 are invited to attend. There is no admittance charge. A cash bar and wood fire pizzas from Pizza Amore will be available for purchase. Class Of '87 25th Reunion Information - 2012. Tickets are on sale now for the July 6, 2012 reunion at the Buffalo Launch Club. Pre-sale price is $35 per person, $65 per couple. After June 22nd, price is $40 per person, $75 per couple. Ticket includes 3 hours, open bar including draft beer and house wines, snack food and hot dogs at 10:30 PM. We are working on a mailing list to ensure that all of our classmates are invited. Please send on any addresses you may have. Payments may be made by mail to Susan Marston, 962 Whitehaven Road, Grand Island, NY 14072. Any questions or suggestions let me know! I look forward to seeing everyone in just a few short months! Class of '72 Reunion July 6 & 7, 2012. Saturday, July 7th - Dinner at the Holiday Inn Settlement Room at 6:00 p.m. For complete details see Invitation, Missing List and Information Questionnaire. Attention Grand Island Classmates of the 60s and 70s. Come join classmates from the Grand Island classes of the sixties and seventies - save this date: Sunday, July 3, 2011. 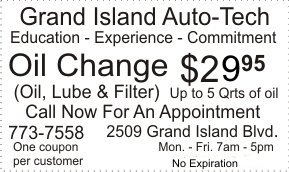 IsledeGrande.Com from its inception has been interested in promoting Grand Island. We host and maintain webpages for almost every group on Grand Island, posting news to their pages weekly. We want to Welcome Current Grand Island residents and residents from the Past to "ReUnion Central." This will be the home base, with links to All Graduating Classes and their News and ReUnion Pages. On each Class Page we want to link to photos from your yearbook and to a Special Page in our Guestbook, just for your Class. Check out the Class of 1967 Page, for an example. We gladly format each year's page with the same links. The more current the Guestbook Entries are, the less work it will be to organize your next Class Reunion and the more "Connected" your class will be. It is our pleasure to provide this service. Please submit any news about your Class including reunion photos to Jodi Robinson, Grand Island's Town Historian and Editor of IsledeGrande.Com. The Riverside High School Class of 1972 is planning a reunion for Saturday, September 25, 2010 at Classics V Restaurant. If you were a classmate or a teacher during the years 1968-1972 we would love to hear from you. For information please contact AnnMarie Kenney at 716-634-3032 or email rhsfrontiers@aol.com.